McCoy College of Business Cuff Links | Texas State University by College Jewelry at Helix Alumni. MPN: C-318N1-SSA5. Hurry! Limited time offer. Offer valid only while supplies last. McCoy College of Business at Texas State University cufflink collection is designed to allow you to show your spirit in a classic and subtle way. 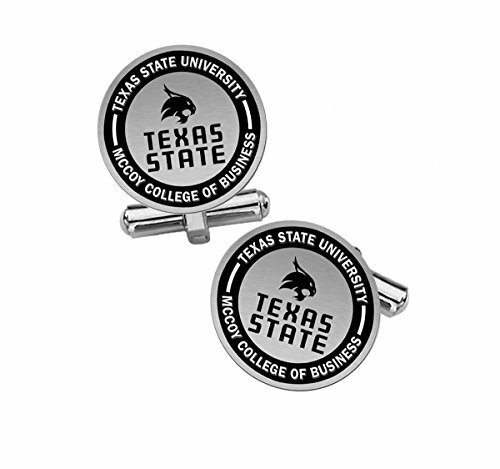 McCoy College of Business at Texas State University cufflink collection is designed to allow you to show your spirit in a classic and subtle way. Traditionally you see cufflinks that are constructed from materials that are designed to last a short time. These cufflinks are made with premium solid sterling silver with a thick top and deep engraving. You can have these cufflinks made with a black enamel background for contrast or a natural finish for a more subtle look. We use a combination of modern technology to mark the cufflink and traditional methods to hand finish. Once the cufflink is complete we coat the entire cufflink with a metal called rhodium to allow the cufflink to resist tarnishing.